Now THAT is a mascot! "An important part of the College’s history is encapsulated in the name of its football team and their mascot. During a period of campus unrest in the early 70’s, many in the student body felt the administration was funneling far too much money to the school's sports teams and not enough to educational needs. The student body was asked to vote on a new name and school colors for the football team; the vast majority of participants opted to call the team The Fighting Artichokes, and chose team colors of pink and white. The administration chose to ignore the election and continue with the 'Drover' mascot and colors of red, white and blue. The students were furious. Since the election was facilitated by the League of Women Voters, the results were binding and could not be overturned except through another election. A second election followed and the student body overwhelmingly kept "Artie the Artichoke" as their representative. Some 30 years later, the colors were changed to green and gold. 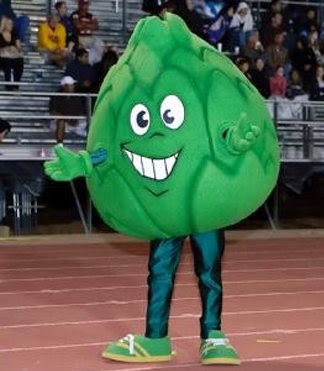 Artie the Artichoke was adopted as the school mascot; originally intended to be a source of embarrassment, Artie has been embraced by students, athletes, staff, and the community as a beloved character." YESSS! Go Artichokes! The Football team does a huddle that looks just like an artichoke.